Vowels are a, e, i, o, u, sometimes y as in sky, and sometimes w as in few (double u=w=uu), as in few=feuu. Both vowels and consonants are inconsistent but vowels are much more inconsistent; each vowel has, at least, 5 sounds and 12 spelling patterns. Every vowel has a short sound, a long sound, and a number of other sounds. The symbols of long vowels are ā, ē, ī, ō, and ū. The symbols of short vowels are ă, ĕ, ĭ, ŏ, ŭ. A long vowel sounds like its letter name. As in fāte, the long ā sounds just like the name of the letter A. A short vowel is unique sound of a vowel, as in the unique short ă sound in făt. Vowels are the strong letters because they are filled with sounds; they are responsible for the sounds we make in our speech. Vowels are so strong; they often help each other in spite of having a consonant between them, as in fāte. Focus your vision on the vowels when you read, because they are the important letters. 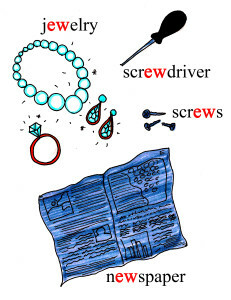 Vowels rule English and learning all the rules that govern the spelling of vowels in words cannot be avoided. ♦ The vowel A has 5 major sounds, which are spelled in 12 spelling patterns. ♦ The vowel E has 7 major sounds, which are spelled in 17 spelling patterns. ♦ The vowel I has 8 major sounds, which are spelled in 19 spelling patterns. ♦ The vowel O has 12 major sounds, which are spelled in 20 spelling patterns. ♦ The vowel U has 6 major sounds, which are spelled in 28 spelling patterns. 1- The first rule of vowels: When two vowels are walking, the first one does the talking, as in rain, meat, tie, coat, and argue. 2- The second rule of vowels: Two vowels can still walk when there is only one consonant between them, as in fate, Pete, site, hope, and mute. One consonant between two vowels is too weak to keep the vowels from helping each other, and this is the reason consonants double so much, as in sitting, dressed, controlled, hopped, and grabbed. Consonants are the rest of the 26 English letters, which are b, c, d, f, g, h, j, k, l, m, n, p, q, r, s, t, v, w, x, y, and z. Certain consonants occasionally sound and act like vowels, like the o in choir and the u in language. The eight consonants c, g, h, q, s, x, w, and y are inconsistent because they make over 50 sounds we call phonics, which are spelled in 60 major ways we call spelling patterns. For instance, the consonant s sounds like its letter name in soap but like a z in rose, has, and bags. Consonants are soundless unless they are paired with a vowel. Consonants are the weak letters and this is the reason for doubling consonants. For instance, the final s often doubles as in progress because one s is so weak; a single final s often doubles to keep itself from turning into a z, as in is has, was, has, was, etc. In addition, one consonant between two vowels is too weak, we need two consonants to keep vowels (the strong letters) from helping each other; compare hŏpped with hōped. Thank you Janet. Glad I could help.